The Red Sox announced in a release that John Farrell will return as manager of the big league club in 2016, provided he is healthy after undergoing chemotherapy for Stage 1 Lymphoma. Interim manager Torey Lovullo will return to his role as bench coach. The contracts of first base coach Arnie Beyeler and strength and conditioning coach Pat Sandora have not been renewed. Third base coach Brian Butterfield, hitting coach Chili Davis, assistant hitting coach Victor Rodriguez, and pitching coach Carl Willis will all be retained. Dana LeVangie, who moved into the role of interim bench coach in August, will also be retained and move back to his role as bullpen coach. Read the full release here. With the regular season coming to a close in the major leagues, several young graduates and soon-to-be young graduates finished the 2015 season on high notes. Henry Owens finished with 11 starts in a Boston uniform, going 4-4 with a 4.57 ERA in 63.0 innings pitched, striking out 50 and walking 24. Eduardo Rodriguez (pictured right) finished the season strong, posting a 2.22 ERA in four starts in September and October. 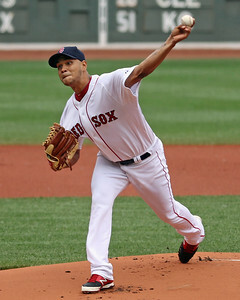 He caps off 2015 with a 10-6 record in 21 starts with a 3.85 ERA in 121 2/3 innings pitched, with 98 strikeouts, 37 walks and a 1.29 WHIP. Xander Bogaerts made a huge jump in 2015, finishing second behind Miguel Cabrera in the American League batting race with a .320 average. He had the most hits in Red Sox history for a player age 22 or younger with 196, breaking a record set by Ted Williams, and also had an OPS of .776. Blake Swihart was injured in the final game of the season, but filled in admirably in a season where the Red Sox found themselves short staffed at catcher. The 23-year-old Swihart finished with a .274/.319/.392 slash line with five home runs and 31 RBI in 84 games. Mookie Betts finished his first full big league season with a .291/.341/.479 slash line,18 home runs, 77 RBI and 21 stolen bases. He finished red hot, posting a .998 OPS in his final 30 games of the year. And lastly, Jackie Bradley Jr., gave plenty of reasons not to give up on him with more wizardry on defense and a bounce back year at the plate. After a scorching August in which he had a 1.163 OPS in 26 games, he cooled off in the home stretch, hitting just .216 in his final 31 games. According to WEEI.com, Yoan Moncada is dealing with a bruised hand after being hit by a pitch during Fall Instructional League play. He is listed as day-to-day. Jerry DiPoto, who was hired by the Red Sox front office as a special consultant in July on an interim basis to help with player evaluation and off-season planning, will reportedly be offered the Seattle Mariners general manager position, according to ESPN. According to Tim Britton of the Providence Journal, the Red Sox will look to make things simpler for Matt Barnes in 2016 after bouncing him back and forth between the rotation and the bullpen this year. Britton also wrote a feature on Travis Shaw who he says has shown a "promising ability to adapt at the plate." Baseball America began releasing its end-of-year top 20 prospects by league and Manuel Margot actually made two of them. Margot was listed as the No. 3 prospect in the High-A Carolina League and the No. 10 prospect in the Double-A Eastern League. Sam Travis and Wendell Rijo also made the Carolina League list, getting ranked ninth and 19th, respectively. Ben Buchanan of Over the Monster wrote that whether he's hot or cold at the plate, Jackie Bradley Jr. is a valuable part of the big league team.